This world goes after beauty, it does not even pay heed to the objects that don’t seem pretty at all. Yeah, it is human nature that beauty is at once being attracted too. Whether buying an outfit, or a decoration piece, whether it is about growing roses in the backyard to the face that looks gorgeous, whether looking at the colorful typography poster to a beautifully built logo design; everything that looks good to eyes, wins over hearts. This is how things are seen. It is rather like a reality check. Therefore beauty is the only one primal element in in order to make a bigger masterpiece. Every artwork makes sense if it is beautifully drawn, it abruptly gets across the mind and nibbles aesthetic impulses easily. Artists and designers’ amalgamate clarity and creativity with the touch of beauty to make the artworks beautiful. For sure, beauty lies in the eyes of beholder but it shoes professionalism and commitment as well if a design is very well assembled and camouflaged with beauty and grace. I have been making mockups for various purposes and being a designer myself I can very well judge how approval of an artwork becomes a ‘YES’ if it is well presented. Presentation is the key to success therefore do not compromise on it. Make the designs as clearer as possible and leave no stones unturned to make it be the best. 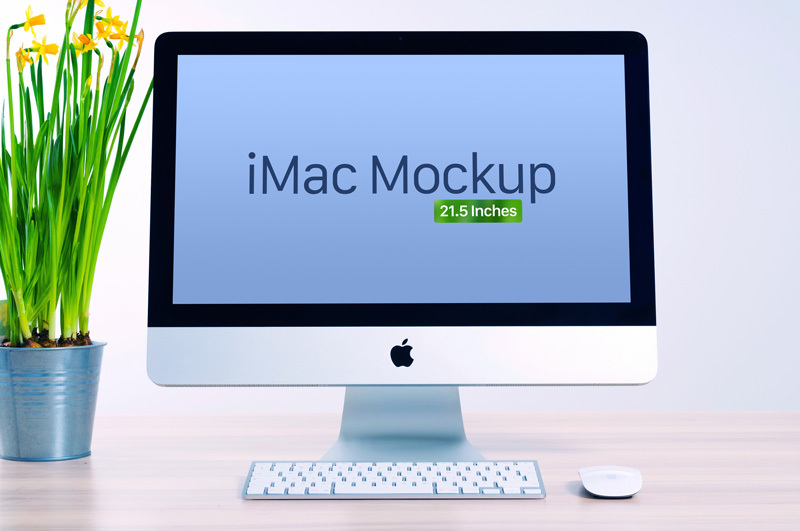 Down here just look at this free iMac mockup 21.5 inches screen that I made to help designers for their presentations. You can show your website design template or theme to your client through this mockup so to have given a fair idea how the site will appear and display on an iMac screen. This mockup can also be used for multipurpose the way you want. Mockups are super helpful for the purpose of presentations so make sure you give your best efforts into the mockup you use and customize it the way you want. For more design freebies and mockups, do check out on the blog, we have more things stocked up coming your way to inspire you, aware you, educate you and up to date you, here we go!